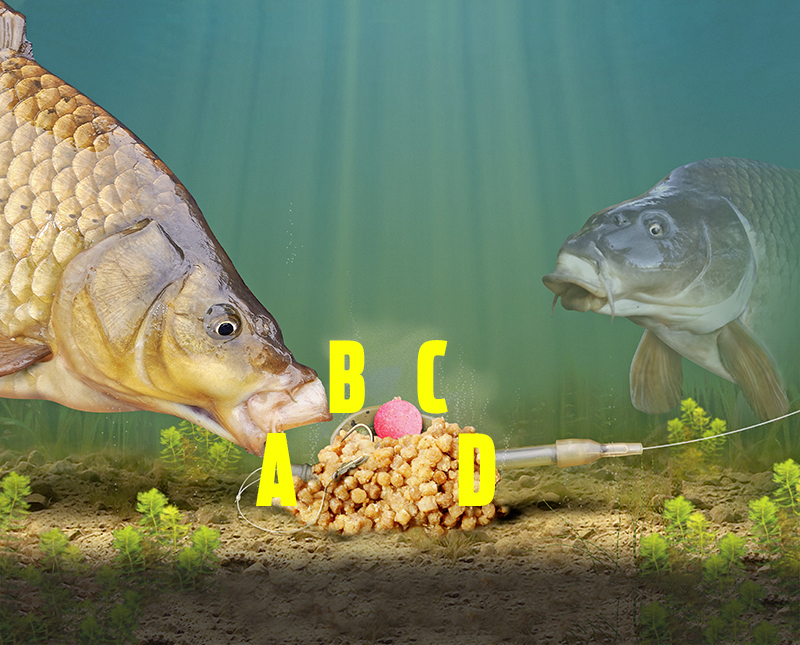 There are a number of different types of feeder to use on commercials for carp in early spring – but which one is really the best? By far and away the top choice is the Method feeder, allowing you to tuck a bait inside a ball of feed and have both mixed together once the feed breaks down in the water. It’s also a self-hooking rig, meaning there’s no hitting tiny knocks on the quivertip. When a fish is on, you’ll know about it! Making the rig is easy, too, as most fisheries insist on your set-up being free-running. The feeder is threaded on to the mainline and then stopped by a bead or stop above a short hooklength of around 4ins. The bait is then buried inside the feed, with the mix moulded around the feeder. As this feed breaks down quickly once in the water, the bait is exposed and the bite normally isn’t long in coming. By keeping a tight line between feeder and rod, bites are extremely positive and often result in fish hooking themselves. A feeder of around 15g to 30g in weight is fine. The only change here would be when fishing on the slope of lakes where the water starts to shallow up leading to the margins, such as you’d find when casting to a far bank or an island. In this situation, a slightly heavier feeder will be needed to grip the slope and stop the feeder rolling down into the deep water. There are a variety of Method feeders available but these can be narrowed down to in-line or elasticated versions, a flatbed being the best shape. This is a perfectly flat feeder that will sit flat on the bottom. Fishery rules often dictate whether elastic can be used. An inline model is safer, and works by having the line running through the body. Any bait will work, but anglers do like to try and use on the hook what they’re putting around the feeder. A banded or soft 6mm pellet is often the number one choice, but in clear water, a brightly coloured 6mm or 8mm mini boilie can produce surprising results. When it comes to feed you have a choice of groundbait or pellets with the Method. A fishmeal groundbait with a few small 2mm micro pellets dampened down before use is fine, but if you are fishing for just carp, do away with the groundbait and load the feeder up with just micro pellets.